The PHH-127 series has been discontinued. Please see the PHH-7000 as a possible alternative or contact our Flow Engineering department. An upgraded version of our PHH-126, the PHH-127 has been designed to bring you the most advanced and most functional water tester in the market today. The PHH-127 has a built-in rechargeable battery with wall plug charger with a standard charging time of approximately 2 hours. It can measure 5 parameters including, ORP (mV probe sold separately), pH (probe sold separately), conductivity (CF or EC), TDS (PPM) and temperature. 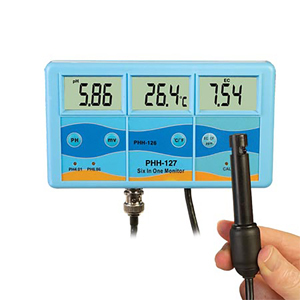 The multi-parameter water quality monitor is a versatile instrument with a reliable multi-probe system which is easy to read, economical and can be used by technical or non-technical personnel. 참고: Comes complete with a built-in rechargeable battery, charger, mini screwdriver, wall mount hardware and operator’s manual in a hard carrying case.